[Episcopal News Service] Diocese of San Joaquin Episcopalians gathered joyously Dec. 1 to welcome a new cathedral dean and to celebrate the first deacon ordinations at St. James Cathedral in Fresno, California, in at least a decade. “We’re calling it a diocesan day of celebration,” San Joaquin Bishop David Rice said. “In the morning we installed the Rev. Ryan D. Newman as cathedral dean, and in the afternoon, we ordained four new deacons. 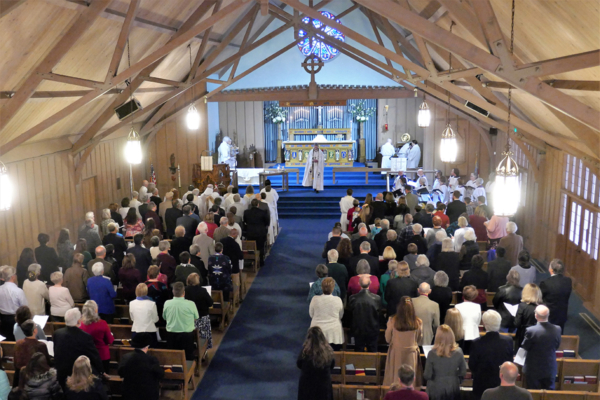 In 2007, the former San Joaquin diocese broke away from the Episcopal Church over disagreements about the ordination of women and LGBTQ people, and same-gender blessings. Calling itself the Anglican Diocese of San Joaquin, the breakaway group attempted to keep the property, including the Fresno cathedral. Those who chose to remain in the Episcopal Church reconstituted the diocese. A series of court battles ensued and, according to Rice, all but one property has been returned to the Episcopal Church. Newman was the rector and headmaster of All Saints’ Church and School in Kaap’a, Kaua’i, in the Diocese of Hawaii, and had no thoughts of moving on – until San Joaquin Canon to the Ordinary Anna Carmichael called him. Newman, 42, hails from South Orange County in the Diocese of Los Angeles, and attended St. Margaret’s School in San Juan Capistrano. 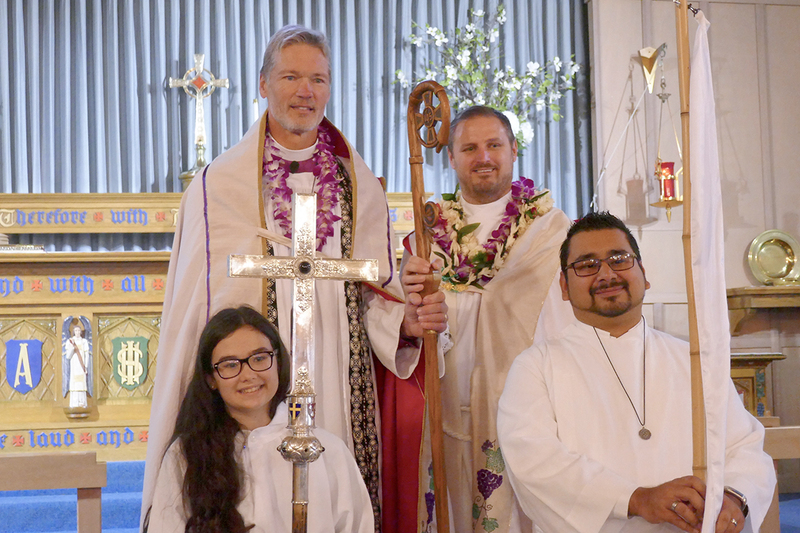 Ordained a priest in 2003, he served for 11 years as chaplain and director of operations at Campbell Hall a 1,000-student Episcopal school in North Hollywood, before moving to All Saints’, Kaua’i, a historic church he helped to regenerate. Now, he hopes to parlay that experience to St. James Cathedral in Fresno. “Bishop Rice wants to make it a place where it’s not just about worship on Sundays but about what happens between Sundays, about how we become the people of God and church in the world. It’s about getting out there and doing outreach and advocacy and community,” Newman told ENS. Rice counts the Dec. 1 ordinations among “the moments of resurrection” the diocese experiences daily. Greg Masztal was ordained Dec. 1 and said becoming a deacon caught him by surprise. “I joined the church 5½ years ago and I didn’t see this happening, … but I am willing to see where I am led,” he told ENS recently. Concluding the court battles represents a significant shift in the diocesan landscape, which will “be different from most dioceses,” he said. Despite challenges, the San Joaquin Diocese is “in good heart,” and Rice sees a seismic shift in the landscape. 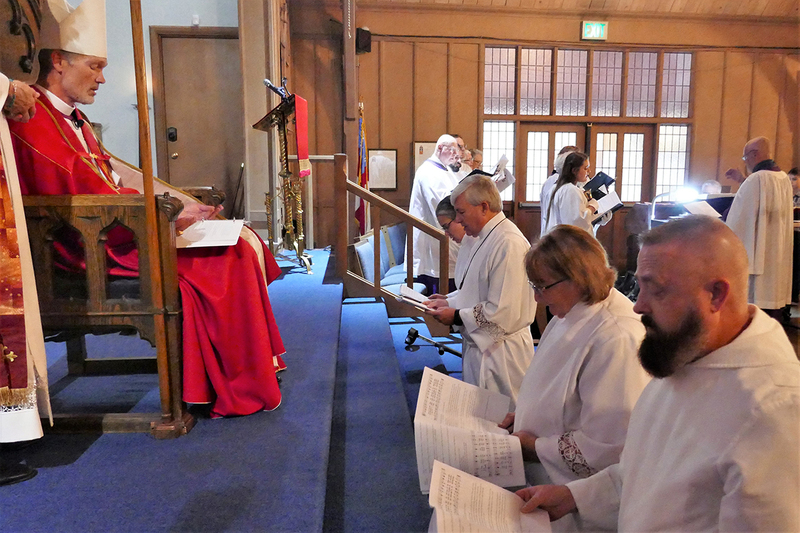 There are numerous inquiries from across the church and around the country to fill upcoming vacancies from those wanting to experience the kind of “liturgical laboratory” represented by the rebuilding efforts. Increasingly, new relationships are being forged, from the voices of the homeless to nonprofit organizations, ecumenical partners and academic institutions. There are other shifts: “Rather than talking about average Sunday attendance, we are talking about AWE – average weekly engagement, an acronym coined by Canon to the Ordinary Anna Carmichael,” Rice said. There is HUB – Helping Urban Cyclists – which serves homeless residents by providing bicycles for transportation. There is a warming center for the homeless of Visalia. And there is a diocesan immigration task force “engaged in really substantive conversations about refugees and our sisters and brothers who have that status and how we can be of assistance and a voice where sometimes they are voiceless,” Rice said.